Prepare your omelette ingredients and when ready, mix together in a bowl with the egg. Either use a non-stick frypan which doesn’t require any oil or lightly spray or grease a medium sized frypan and heat it over a low-medium heat. Pour in your ingredients. Allow to cook for a few minutes until omelette mixture is almost entirely cooked, then using a heat-proof spatula, flip one half of the omelette over the other half. Continue cooking until egg is thoroughly cooked. Serve with toast and a smile! Variation: This is a totally legitimate ‘breakfast for dinner meal’! Pull this one out on those evenings when you really can’t be bothered to get more than a mixing bowl and a frypan from of the cupboard. Serve with a side salad or some veggies as well. Post-GDM tip: I would thoroughly cook eggs during pregnancy but would otherwise leave eggs slightly runny or ‘drooling’ as the French say. Makes for a creamier tasting omelette. 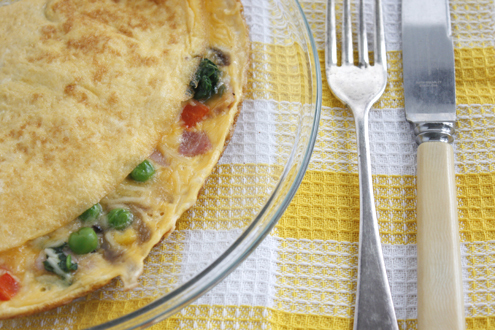 Omelettes are one of my all-time favourite quick and healthy meals. When I’m feeling lazy, some sliced mushrooms, spring onions and a little parmesan works a treat as a filling.